4.14.2013. In an exercise in self-absorption, I've been photographing the pages of my handwritten notebooks and turning the years (2004-2012) into fat PDF volumes that I can review on my iPad. I was wondering why 2005 was such a thin year. Then I remembered it was the year I started my Ebay store and the year I discovered family history research. And I wrote something -- anything -- nearly every morning in Mad In Pursuit to entertain my parents during what turned out to be the last year of my dad's life. I began to browse through those entries. Here I am in 2013 trying to write stories about the knick-knacks on our shelves, trying to dive deep into what it means to live with art. But there I was, at the beginning of 2005, meditating on the little collectibles found in our "to sell" boxes as they made their way into my new store. "Priceless throwaways" I called them. 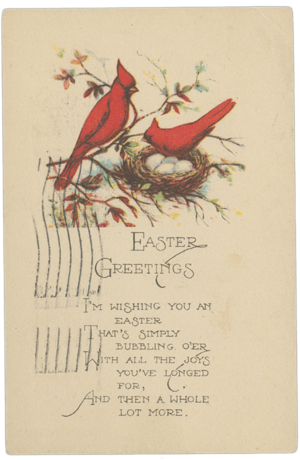 The postcard above captured my imagination -- a thoughtful note from Coral, written on an Easter postcard, to her friend West. From the small town of Auburn in Cayuga County to a crossroads in Wayne County. Depth of the Great Depression. "No work yet, maybe soon now, soon as weather gets better..."
So what do I do with these tiny tales? Who might be interested? Who would get it? Should I recast these old posts under the heading "joy of simple things"? Or the "collector's apprentice"? Maybe I could pull them together as a little Kindle book: "Meditations on Opening an Ebay Store"? Who cares is the ultimate question. Who cares what I have to say about these fleeting items because who cared about them in the first place? 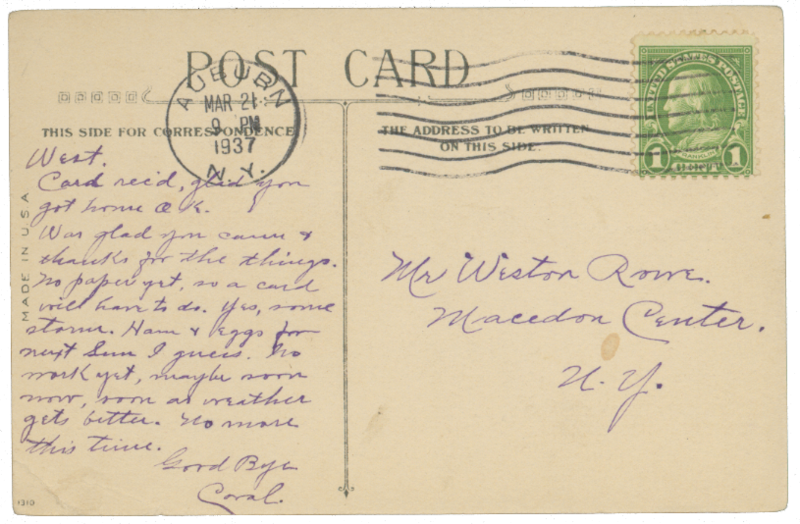 A quick check on Ancestry.com tells me that Weston Rowe was 33 when he received the postcard above. He was repairing automobiles in 1930 and railroad cars in 1940 and still living with his parents at age 36. So maybe he never married. When he died in 1985, his relatives sold off his crap, including the postcard from Coral that he'd kept for 48 years. No doubt Jim got the postcard as part of a package deal, filed away the ones he wanted and threw the rest in a discard box. 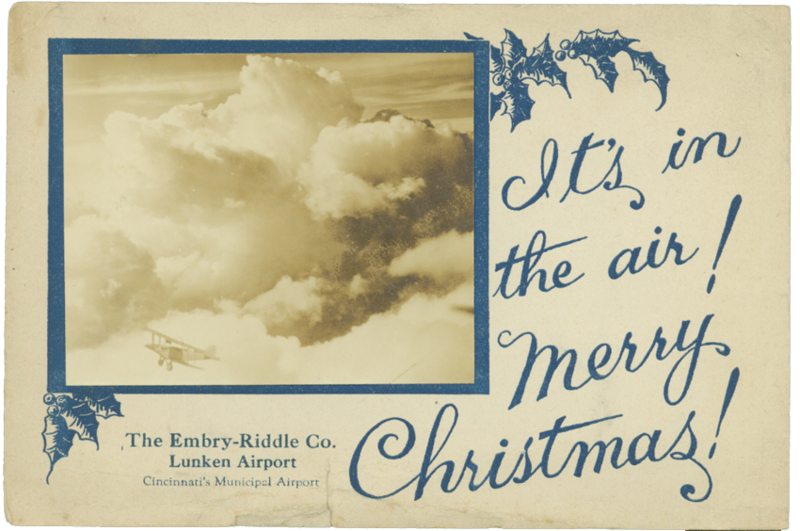 Likewise, my brother Tom collected the Christmas card from someone's trash... after someone had kept it for 77 years. Of course, just hanging on to something in a keepsake box or a junk drawer doesn't necessarily mean "caring." I hope that someone gives me some ideas. I started a "theme page" for these ruminations ages ago: ebay theme. The formating is old and the photos seem to be too small and/or the expected enlargements don't work. But there they are.